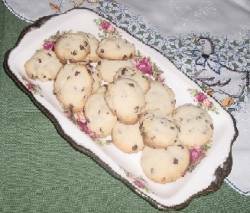 A lovely cookie to serve at an afternoon tea, or make up a few batches during the holidays to give as gifts. Preheat oven to 350 degrees F/180 degrees C.
Cream together, butter, sugar and eggs. Mix in remaining ingredients. Blend well. Drop by teaspoonfuls onto a cookie sheet. Bake in preheated oven for 8-9 minutes. Cookies will be soft. Cool about 1 minute on cookie sheet then remove to a wire rack to cool completely. Very delicious and everyone's favourite.